I've been away from the blog for a few weeks experiencing the marine environment instead of just writing and dreaming about it. I just got back from spending some time in Cape Canaveral, Florida. While I was in Florida, the sea turtle nesting season started, and everyday while walking to the beach I saw signs like the one below warning me about not disturbing nesting turtles from May 1-Oct. 31. In addition to being reminded daily about the nesting season, Frederick (Fritz) Davis (my Master's advisor at Florida State University) gave me a beach reading book: The Case of the Green Turtle: An uncensored history of a conservation icon by Alison Rieser. I'd previously read Fritz's book, The Man Who Saved Sea Turtles: Archie Carr and the Origins of Conservation Biology and Rieser's book dove-tailed nicely with that story of Carr, his research, and political action to save sea turtles from extinction. Both books are difficult to read- partially because I'm a Florida State girl so I have trouble reading books that place Florida Gator's in the spot light- but mostly because, sitting on the beach in Canaveral, having just passed a sign suggesting that communities care about these creatures, I was appalled to read about the horrific treatment of these defenseless ocean giants in the past. The pictures in Rieser's book are jarring to say the least, so I'll only recount one disturbing portion. In Chapter 2, the author discusses the treatment of green turtles in Australia in the mid 20th century. 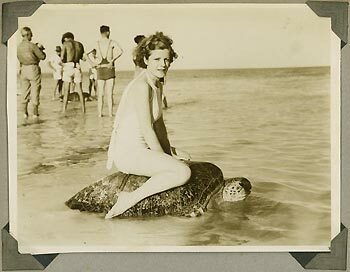 In the 1940s and 50s, turtle riding was a popular attraction on the Great Barrier Reef. During nesting season, people would turn nesting female turtles on their back so that they could not return to the ocean after egg-laying- preserving them alive but immobile for riding the next day. The next day, tourists got their chance to ride the females as they struggled to return to the water. Although this practice didn't involve killing the animals, it seems particularly cruel to ride an animal who is ponderously slow and out of its element. According to the National Geographic caption of the second picture, once the turtles made it into the water, the process of riding became much harder and this turtle shook off her rider and plunged deeper within moments. Good on you, turtle! The largest threat to sea turtles wasn't riding them; it was the use of turtles and tortoises around the world to supplement sailor rations and stave off scurvy during the age of exploration. Today, we associate scurvy and its cure with fresh fruit, specifically lemons and oranges. But this is a colloquial and limited understanding of vitamin C and how to get it. If vitamin C was only obtainable via citrus, how did peoples in Artic areas avoid this painful condition? In fact, many marine organisms contain vitamin C in their flesh. 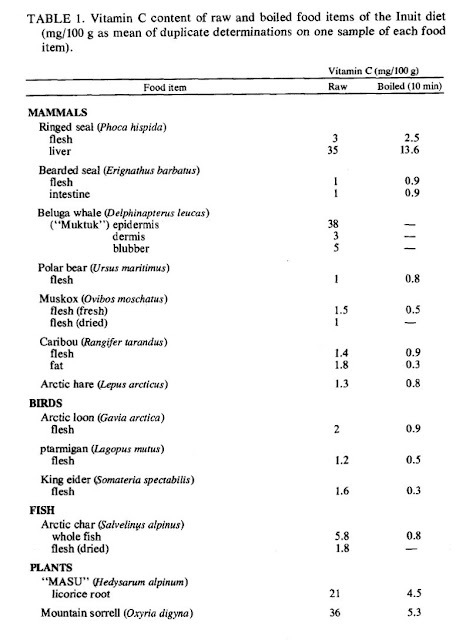 The chart below shows the vitamin C content of the marine diet of animals the constituted the Inuit diet before the arrival of Westerners. After contact with explorers, Inuits began to rely more heavily on canned foods, or adopted the process of cooking their food instead of eating it raw, which you can see below would lead to a rise in scurvy pretty quickly. Garci and Smith, "Vitamin C in the Diet of Inuit Hunters in Holman, Northwest Territories" Artic 32:2 (June 1979) 135-139. Explorers in warmer climates also developed scurvy, ran out of rations, or longed for fresh meat instead of dried tack for months on end. They satisfied dietary and gustatory cravings with sea turtles. Sea turtle meat is high in Vitamin C and apparently quite tasty if consumed fresh. 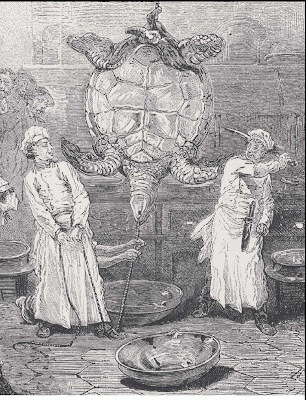 While sailors developed a taste for turtle out of desperation, the importation of the delicacy into their home ports caused a new culinary craze. Consuming turtle soup was an indication of class- served at royal dining tables and in the newest restaurants. Wealthy people looking for a way to distinguish themselves through food consumption found turtle soup fit all the bills of culinary exclusivity. The best turtle soup relied on fresh turtle flesh and fat- meaning that turtles had to be transported live from warmer waters to Northern docks. In addition, the preparation was no easy task. The chef had to dismember the turtle, and this was gory and time consuming. Trubek, "Turtle Soup" Gastronomica, The Journal of Food and Culture 1:1 (Winter 2001) 10-13. Turtle soup was supposedly tasty, but more importantly, it was expensive and the mere inclusion of the delicacy at a European table demonstrated enormous wealth. Many different types of turtles were eaten by sailors, including the Galapagos Tortoise, but European and American turtle soup relied on two species: black diamond terrapins from the Atlantic Coast of America, consumed in fancy New York Restaurants like Delmonico's, and the green turtle, shipped and consumed throughout the rest of the world. Marine zoologists, ecologists, fisheries biologists, and aquarists became aware of the rapidly declining tortoise and turtle populations by the turn of the 20th century. The United States Bureau of Fisheries, under the direction of Huge Smith, set up a captive breeding facility for terrapins at their marine laboratory in Beaufort, North Carolina as early as 1912. In 1928 Charles Townsend, the Director of the New York Aquarium, imported some of the last remaining Galapagos tortoises to points throughout the United States for captive breeding. And by the 1950s, Archie Carr among others began steps to establish marine sanctuaries and protected breeding and nesting grounds for green turtles. Even though it was the last of these three to be protected, the green turtle was the only one still being hunted for food. Americans had lost their taste for terrapin by the time Smith began his breeding program and the damage to the Galapagos tortoise population was then primarily caused by introduced predators, not consumption for food purposes. But due to advanced canning techniques, the demand for green turtle meat for turtle soup was at a high when Carr began his crusade. Because sea turtles usually returned en masse to only a few beaches to lay eggs, they were especially vulnerable to egg and turtle poachers. Carr urged governments to protect known nesting grounds, but the harvest of turtles in other locations continued to deplete the species. In addition to protecting beaches, Carr and other concerned scientists and citizens sought to prohibit the legal trade and sale of any products from the green turtle. Reiser's book highlights the importance of getting the green turtle placed in the "red book"- the first listing of species thought to be critically endangered or close to extinction (first published in 1964- the green turtle was added in 1966). It's difficult to describe a "normal" year of turtle activity merely by numbers: Carr and other biologists struggled in their conservation efforts because turtle visitation to particularly nesting grounds varied greatly year to year (see the chart below). It was difficult to get an accurate count of the species because they only nest once every few years (and they often return to the same beach up to three times in the same season). The struggle to get the species listed as endangered revolved around the effort to accurately estimate the number of turtles left with such variable data and Davis and Rieser both highlight these difficulties in their work. The acknowledgement of the green turtle as endangered effectively stopped the trade in green turtle (something with implications I will talk about in Part II) and helped environmentalists raise awareness about the plight of the species. While vacationing in Cape Canaveral, I didn't see any see turtle nests- it was a bit early in the season. But just south of that location is the Archie Carr National Wildlife Refuge near Melbourne, Florida. Established in 1991, the refuge provides protective habitat for another type of endangered turtle- the loggerhead- although green and leatherback sea turtles also nest on the 20.5 miles of beaches. So far this year 12 leatherback turtles have laid egg clutches on the beach but no green or loggerhead turtles. The chart below shows the nesting numbers from 2001 to the current season. Sea turtle conservation efforts are ongoing. Turtle soup is a thing of the past, you would be hard pressed to find a large group interested in riding turtles on vacation (although you can volunteer at the Archie Carr Sanctuary for "turtle watch"), and through public outreach and education beach goers are warned they should be conscious of light pollution and dune trampling. But humans continue to expand into the environment that nesting turtles require to survive and conservation efforts sometimes depend on the economics and culture of local populations- something I'll write about in Part II.